Jazz Community Site - Jazz Team Blog » Fun with Report Builder – the way report writing should be! I’ve worked with many customers over the years to develop and deploy IBM solutions and, for the most part, I avoided the notion of reporting like the plague. Bad news since, in my humble opinion, reporting is an absolutely critical aspect of any solution. After all, how will you prove the solution made a difference without reporting? How will you have confidence that you can continuously improve without reporting? How can you justify the expense of the solution, the extra learning required? Without reporting, the value of any solution cannot be fully understood – and it certainly cannot be proven. So why has reporting in the past been such a chore, so difficult that many organizations must have skilled resources dedicated to the job? Why must it be so complex that, unless you have a PhD in data management or skills in relational databases or a deep understanding of the data warehouse schema, you cannot possibly craft useful reports? Why can’t this be more fun? When the Jazz Reporting Service (JRS) feature was introduced as part of IBM’s Collaborative Lifecycle Management (CLM) solution in the 5.0.2 release, I thought I would dip my toes in the frigid “report writing” waters and give it a try. I didn’t have high expectations – and I had no expectation at all that I might actually love report writing. I do now. Rarely a day goes by that I haven’t at least touched one of our reports. I could not do my job – or help clients do theirs – without Report Builder (the easy-to-use interface provided by JRS). I use it on a daily basis now on my own internal projects and I am proud to showcase the capabilities to customers because it is so incredibly cool. Let me tell you why. Report Builder walks you through the process of crafting a report in precisely the way that you need to think about it: choose your data, format your results, name and share it, run it. As part of choosing the data, in addition to the normal stuff like report type and scope (by the way, did you know that you can report across all CLM applications, all application instances and even across Jazz Team Servers? ), the process of actually building your report begins here with the selection of a starting artifact, or pivot point as I like to think of it. From here, you build the tree that gathers the data. It’s stupid-simple and natural in its simplicity. Yes, you need to understand how your data “hangs together”, but you don’t need to understand the underlying metadata schema in the database. Any user of tooling that feeds data into the data warehouse will know how to build the traversal tree. Take a look at an example. 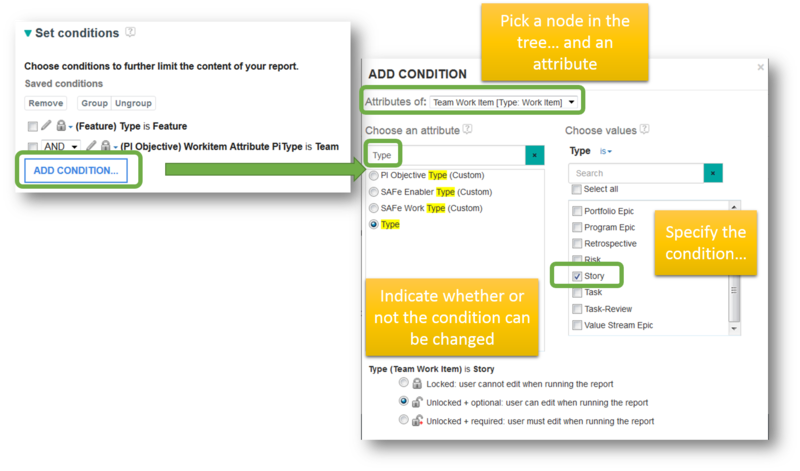 The tree shown here starts with a Feature work item type and then associates all child work items. It then picks up the PI Objective work item types that the child work items contribute to. You can also see that the Feature -> Team Work Item relationship is required while the Team Work Item -> PI Objective relationship is not. That means that I want to see all Features with children, whether or not they have PI Objectives. Once you have the tree, everything else is a snap. Need to make the results conditional on attributes like status, type, tags or even customized attributes? No problem. You can even let the user running the report set the conditions dynamically if you like. Here we are adding a condition that says the Team Work Item must be of type Story. We’re also saying that this Type is unlocked and optional, meaning that when someone runs the report they can change the Type if they want to. Voila! You’ve just created a report! It’s that simple. Of course, the possibilities are endless, with many more options to be discovered but I hope you get the idea. And now the fun really begins. 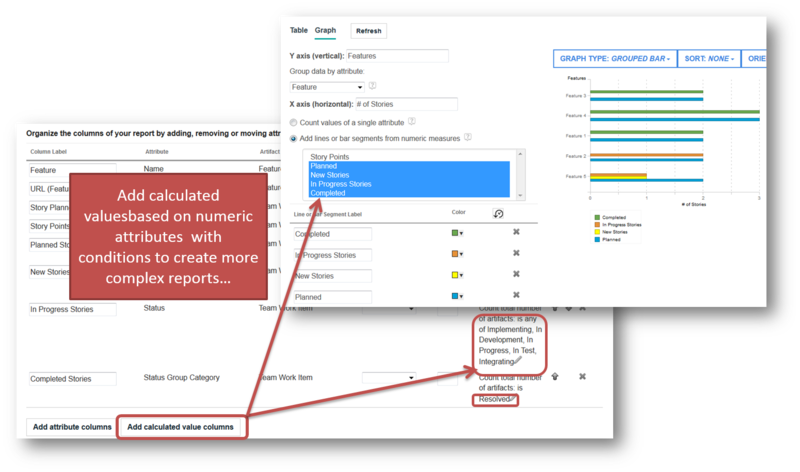 Once you have chosen the data, Report Builder takes a stab at what you’d like to see in the results in a tabular format – and of course you can change that. In CLM 6.0.2, JRS provides abilities like you see in the picture below such as setting the Column Labels, sorting and grouping the output and moving columns. By using the Refresh button you can see sample output, decide what you like and don’t like, make changes and try it again. In the next release, usability improvements enable things like drag-and-drop to change column order. More on that as we get closer to delivery. Now, if that’s not fun enough for you, consider what might be better than tabular report output that is easily customizable and configurable… graphics and colors of course! Report Builder enables you to add graphics as an optional rendering of your results, in addition to the necessary detail of the tabular output, and you can mess with formatting and colors for far too long before reminding yourself that report writing isn’t supposed to be this much fun. I’m serious… you can spend hours if you let yourself forget you have a job to do. After only a few days of using Report Builder, you’ll actually be able to create more complex reports like this one, which includes calculated values based on numeric attributes and takes advantage of the ability to create these values with conditions, such as the work item status. In this case, we show the number of planned, new, in progress and completed Stories for Features. These kinds of reports are not only super easy to develop, but also really robust in their ability to capture a quick visualization of some information and then the ability to drill down into details of the calculated values. The beauty of Report Builder is that it is both fun and worthwhile. Don’t feel guilty, the reports you create are actually quite useful when all is said and done. 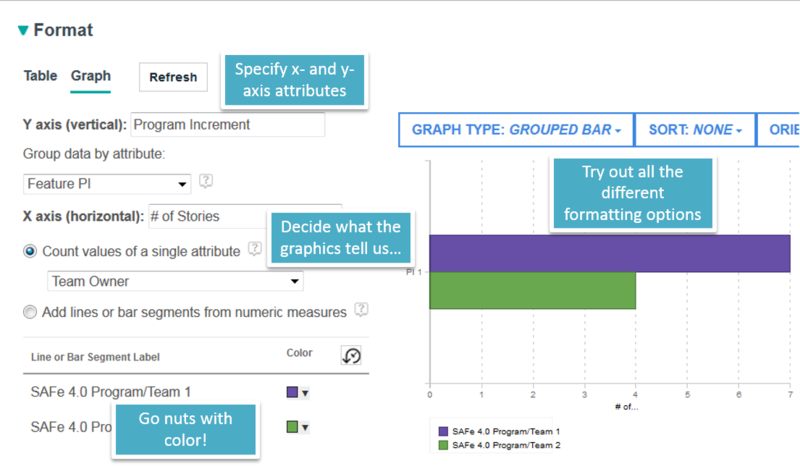 By enabling you to craft reports with both graphical and tabular views, you can provide quick visual insight and the nuts-and-bolts, all wrapped into one report! That’s golden. Now dip your toes into those report writing waters and create some reports! 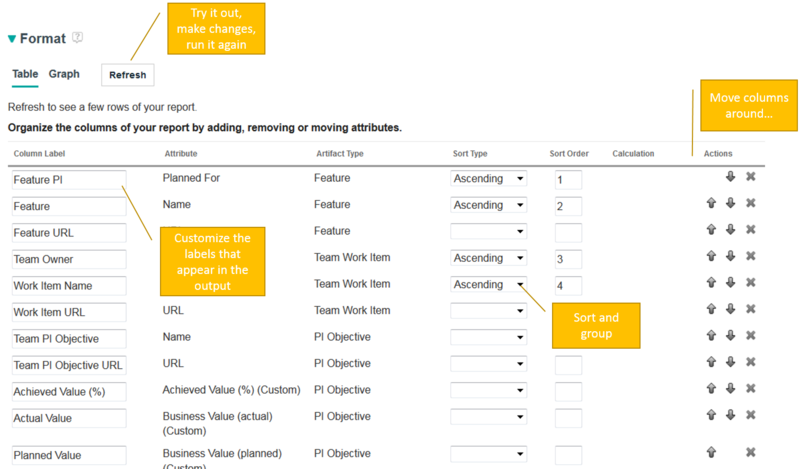 As always, we are here to help you explore Report Builder and the capabilities of Jazz Reporting Service. Don’t hesitate to reach out. And, of course, your feedback is welcomed and appreciated! How about grouping the results? You can group the results (an example of this is shown in the “Format your results” figure above). When you do that, you get output like what is shown in the “Drill down into the report calculations” figure, which is a grouping by Feature of all Stories related to that Feature. It is similar to providing a tree view of results in the tabular view when you take advantage of grouping. And I really like the fact that reports can be added to dashboards as widgets. my system is experiencing a problem. As soon as I select the LQE to start building a report, I am getting this message.” The loading of the metamodel for this data source failed. Please see the log file. 10:06:57 AM” . There are messages that are related to metamodel loading that should go into the rs.log file. That is one thing to try and fix if you see no messages at all. You could go to the Report Builder Data Source Admin page for LQE and see if you can click the ‘Refresh’ button on the LQE data source page. This will attempt to re-load the meta-model from LQE.